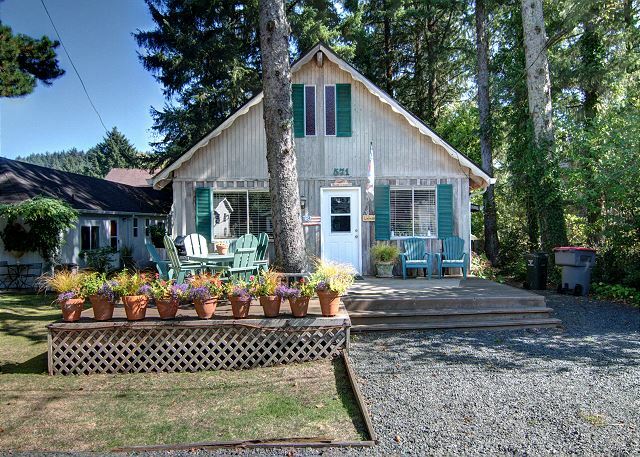 This quaint cottage is the perfect getaway for your family. Just a couple of blocks to the very private north end beach. A quick walk to downtown. The wood burning fireplace in the living room will make your vacation cozy. A queen bed is located up above in the open upper loft. 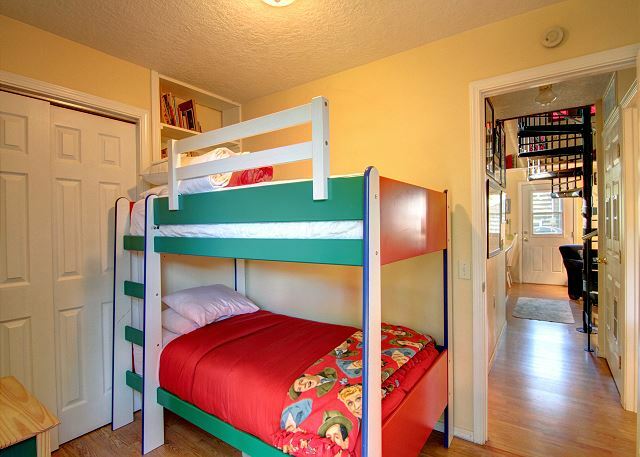 The other bedroom has a queen and the other twin bunks. A small kitchen and dining area are also very cozy. 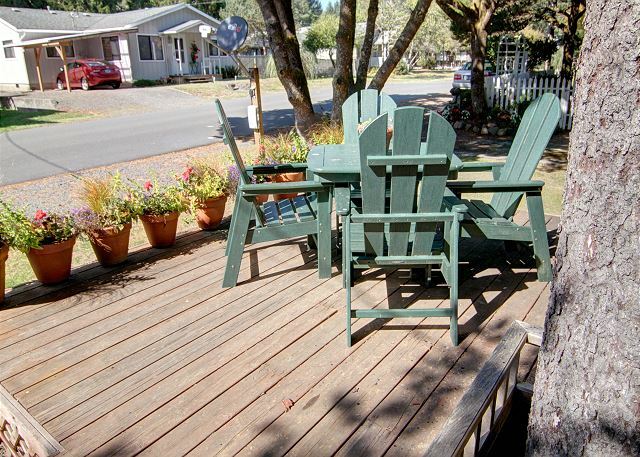 A large outside deck is the perfect place for your morning coffee. Accommodates 6 maximum; pets welcome; no smoking; parking for 2 vehicles. "Beds were soft and the house was cute. Weather was outstanding! " "I was with family and that's always the best!" "Amazing location of house; ease and simplicity of entire rental process"
"This is my second year coming to Calipso Cottage. I just LOVE it and will make it my annual vacation at this beach house! My boys (dachshunds) love it too." 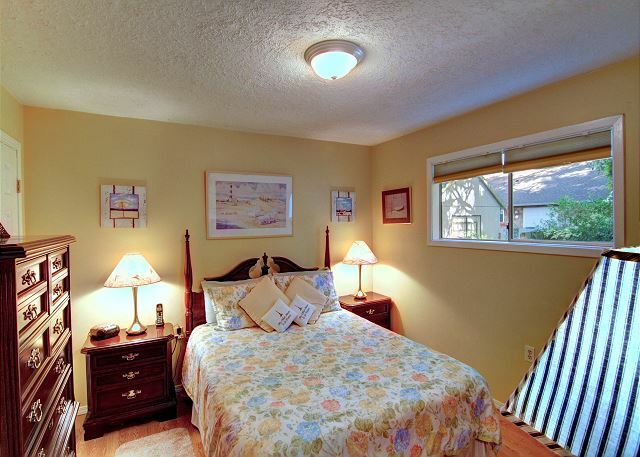 "Calipso cottage is in a quiet locale and pleasant neighborhood. Located at the north end of Cannon Beach, it is ideal if you want less crowds. Beautiful scenery too. The cottage has a homey feel and a great yard for a dog. The beds are a little too soft, but I would definitely recommend!" "Great pet friendly rental for a long weekend stay. Thank you to Cannon Beach Property for mailing me the backpack I left behind." "the house is very comfortable, lovely and clean. I would like back next year. thank you. " "We enjoyed our stay. The cottage was clean. Everything we needed was there. We appreciated the enclosed backyard to let our small dogs out safely. We would return. One recommendation... have a fan for the loft for the warmer days. " "The house was clean and had a well-stocked kitchen. Check-in/out was easy. The pillows were not the best but we made do, next time I'd bring my own. A nice easy walk to downtown/beach, located in a quiet neighborhood." "We had a great time in Cannon Beach at the Calipso Cottage. It is cute and has everything you could need. Loved the fenced in back yard for the dog, and my nephew enjoyed the loft area. We love the north part of Cannon Beach, quick walk to the beach and shops. Only negative I would say is the heat is LOUD when it comes on." "Fabulous weekend, close to beach and everything we wanted. House was clean and well stocked. Will recommend to family and friends. Checkin-out friendly and efficient. Thank you. " "I had an enjoyable vacation, only because the weather was superb! The place was very livable for me and my boys (dogs)!! I am coming back next year!! I am rating all of the questions five stars because I definitely enjoyed my stay. Thanks." "We had a great experience at this very well equipped, clean and comfortable house. Fully stocked kitchen with good quality pots and pans, comfortable furniture and beds. Loved the loft bedroom. Fenced back yard for our dog, close to beach (2 blocks), steep hill but steps alongside road. Very quiet on the beach and gorgeous on the north end of Cannon Beach. Our group included a senior adult, 2 young adults and a 2 year old. The Cannon Beach Property Management team were excellent, as they always are." "Communication and check-in were easy. The house is spacious and very clean, fully equipped kitchen, nice front deck. Recommanded!" "great little house. it had a lot of charm and personal décor made us feel right at home. great selection of books, games, cds, and movies. beach was up a short steep hill but still great access. only disappointment was with the dish service. main tv only received a few obsure channels so no local channels for news or some basic shows. Small bedroom tvs had good selection of local/movie channels so not sure why main tv could not access the same channels. It might be a little tight for 6 but was perfect for four. It was clean, nicely maintained, well equipped kitchen, and theater poster/ocean décor was great! Property management company was very friendly and professional. thank you! " 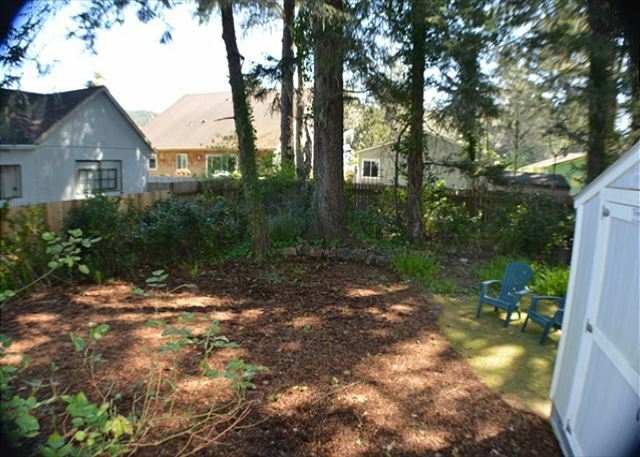 "The house is on a quiet street on the north side of Cannon Beach across Ecola Creek, a short drive to the shops and restaurants and the main beach. Two cars could park at the house. Nice front porch/deck. Circular ladder access to bedroom loft. The mattresses in loft and main floor bedroom were too soft. We did light cooking, good fridge, stove and utensils. Good variety of music CD's and movie DVDs "
"We are two middle aged adults who brought along our grandson for a two day weekend getaway. Our experience was very nice. We appreciated the "right at home" feel to the property. The inventory of books, CDs, and other media were a plus. We enjoyed our stay very much and will book a property again this year." "We had a great time at Calipso Cottage. It was well maintained and clean. Close to the beach, Ecola Creek, and the town allowed us to walk anywhere we needed to go. Great space for our dogs as well. The only issue we had was that the some of the windows did not have screens which meant at night when it was warmer we could not open our windows. Other than that our stay was great and it was definitely a place we would stay at again. " "Calipso cottage was a wonderful get away for our family that met all our needs. Very cozy feel to it and even a fenced back yard for the dog to be able to have privacy when using the restroom :). Loved the upstairs loft for my husband and I and kids loved having their own rooms. Definitely will stay there again sometime!" "We had a great time visiting Cannon Beach. This is the first time staying at this end and really enjoyed ourselves. " "Calipso Cottage is a warm and cozy place to stay with every amenity a person needs. Unlike hotels or cabins, the cottage felt like home and definitely reflects the personality of the owners. I wanted to take the loft home with me. What a great place to sleep! Step by step instructions for using the DVD player and sound system would have been useful for those of us who are technologically challenged but all in all Calipso Cottage is a comfortable, quiet, feel good kind of place that doesn't disappoint." "The location worked out great. I would use Cannon Beach Property Management again." "Had a great time at the cottage - a great little place for a small family, nice amenities, thoughtful extras, and extremely professional staff at the rental company. We'll be back!" "A very enjoyable week. Wonderful weather and a very comfortable cottage in a great location close to the beach. Had a small problem with the plumbing and the rental agency were very professional and solved the problem very quickly. Would definitely come back." "We had a really nice 5 day stay at Calipso with our two small children and dog. There were so many board games, puzzles and movies, so there was always plenty to do! Just a few blocks from the beach. Very clean and cozy cottage." "We stayed here with my parents for a weekend and really enjoyed the house. It was quiet, cozy, and close to the beach. The only issue we had was that the fireplace had malfunctioned for the previous guest and the whole place reeked like a campfire. We left the windows and doors open almost constantly trying to air the place out, and we didn't attempt our own fire. If the fireplace is important to you and you're staying here soon, make sure to ask if that issue has been resolved." "The cabin met our needs perfectly and we enjoyed being so close tot he beach. Looking forward to making this a family tradition." "While his was a very nice quaint house, it was not the right fit for our family. We have two young children, 7 months and 4 years, and they, as well as us, we're having a hard time avoiding the giant spiral staircase that descends from the loft. The house is not very big so the staircase takes up quite a bit of living space. Aside from that, it was a cozy little cottage that is well maintained and not very far from the beach our town. I just wouldn't recommend it for families with very young children. " 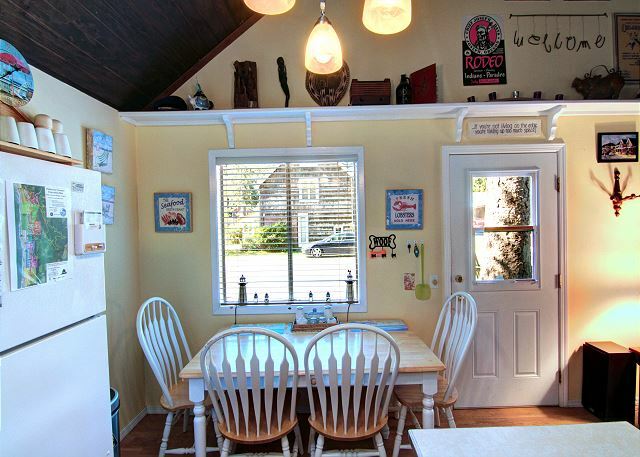 "This is a great, creatively decorated cottage in a quiet residential neighborhood. The ocean is about a 5-minute walk, though the Haystack Rock stretch of the beach is a little farther. The kitchen was exceptionally well-equipped, the beds were comfy, and the house had a lot of special features - such as the spiral stairs leading to the wonderful loft. Loved the big front porch, too, and the big tree growing out of the porch. I couldn't find a washer/dryer, but since we were there for just 3 nights, no big deal. The free WiFi worked great. " "We were very happy with the house. There was 2 couples with 2 small children, the place worked out great. Enjoyed the movies and games provided "
"It was a great property on the quiet north side of Cannon Beach, away from the sometimes busy town proper. Would definitely return. " "cute little house within walking distance to beach and some shops and great eateries, it was clean and furnished very cute and beachy"
"I liked that the house was in a quiet neighborhood. It was a quick, 10 minute walk to get downtown. The laundry facilities were a plus. The gas grill was also great. "We had a great time in a nice clean well equipped no complaints !" I would reccomend that they owner put a mini blind on the upstairs bedroom window." "Would have been nice to have had 1 bath towel for each person registered." "I'd be back in a minute if I could...the Calipso Cottage was perfect for us, and I'd recommend staying there. It was cozy, sweet and very clean. Thank you very much." "The only complaints I would have is it would have been nice to have a garbage disposal. We cooked most of our meals there with our family and by not having a disposal was inconvienent. Also, an outside shower would have been nice. We did find a hose with a shower sprayer on it to help a few days into our trip but having an outside shower to clean off the sand from the beach would have been ideal to keep sand out of the house. "We had a wonderful time and so did our dogs! The cozy home with all its amenities was perfect for us. The only thing I would change is a bit firmer bed in the downstairs bedroom. Staying in the quieter north end of town was especially appreciated this visit, as the warm weather brought many visitors mid-town. We would stay at the Calipso again!" "The cottage was a perfect size for our family of 2 adults and 2 boys (11 and 15). In fact, we could have let the boys each bring a friend and still not felt too crowded. It was our first time staying on the north side of town--very quiet. 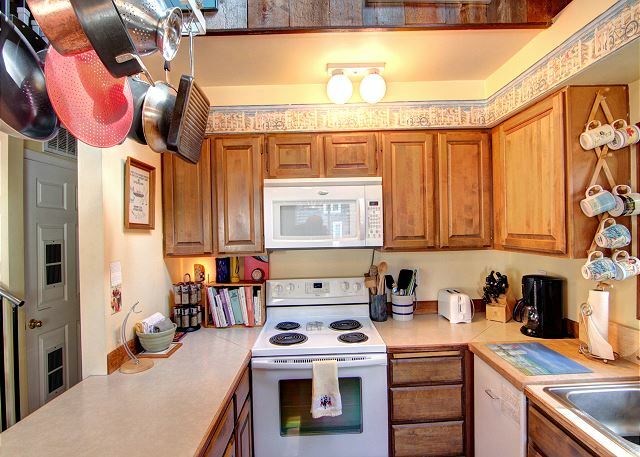 Kitchen is great, lots of pots/pans/utensils provided." "The cottage was of good size and comfort for our family of three children and three adults. The decor was fun and cute. I was very pleased with the location and the area of the beach that the cottage was by. The backyard was unkept but overall the place was in good order. We will definitly stay there again "
"Even though it rained for much of our stay, we thoroughly enjoyed five days in this cozy hideout. Great getaway a short walk from the beach." "Enjoyed my stay at the Calipso Cottage very much, the quiet location close to the beach was the best part. The loft bedroom made for a airy and restful place to sleep. The only negatives were the mattresses on the bunk beds, they need to be replaced. My son and his friend shared the bunk bed room, and both found it extremely uncomfortable, the mattresses were squishy and the support was entirely missing. My son actually spent the second night sleeping on the sofa. Other than that our vacation was perfect, the kitchen was spacious for a small cottage and well-appointed with newer appliances that made cooking enjoyable, not a chore." "This place had an amazing home feel to it. It's only a couple blocks from the beach. It is on the other side of the small river so it seems to be less crowded than the southern part of cannon beach, but still within walking distance to town. Great place to stay!" "Really enjoyed the cottage, will definitely keep the "Calipso" in mind for future getaways. Thanks!" "We haven't heard from the owners when in France. Did they travel ?" "The cottage was beautiful and had an exceptionally well-stocked kitchen. It is located close to town, but unfortunately you cannot walk along the beach to town without taking your shoes off to walk through the shallow river. Not a problem in the summer, but in late fall, it was a little too chilly to go barefoot! You can get to town via the road with no issue. About a ten minute walk. " "We had a wonderfully relaxing stay at the cottage. The place was very cozy. " "Our short vacation at Calipso Cottage was wonderful ! The only thing we were sad about is that we only had three days and two nights. We all would have enjoyed a couple more days.We'll definitely be back to visit this little gem in Cannon Beach. " "The house was a little small for six of us; but we had a good time. There is no view but it is convenient to town and has a good back yard for dogs. The closest beach is at the far north end of town; but it's not hard to get to a beach you like around here!" "We visited Cannon Beach for my daughter's wedding at Breaker's Point. What an ideal location for this event. She dressed for the wedding at the cottage as well as the bridesmaids and myself--mother of the bride. What a nice memory and then to just walk up the hill and to see the Pacific as the backdrop for the wedding. The cottage was clean and cozy. We enjoyed our stay and we would recommend Calypso Cottage to others. " "What a wonderful refuge!! We spent all day at the beach and it was wonderful to be able to come back to the cottage and let the kids rest while we enjoyed sitting on the deck!!" "We loved our stay at the Calipso Cottage! Very cute, great location. I was lucky enough to get the loft to myself and slept like a baby - what a comfy bed! We hope to return next summer." "Amazing stay. Cottage was in a great location, super clean, tidy, nicely decorated and a reasonable price. Would recommend this to anyone." "I would recomment this place. It is close to the beach but far enough out of the main part of town, it was peaceful." "Very cute, but no dishwasher." "The house was cute/funky, clean and conveniently located. The downstairs bed was hard as concrete -- didn't work for me. The upstairs bed was ok, but you have to climb a narrow spiral staircase." "This was a great place for our needs. 2 blks from the beach. Close enough to town to be able to walk in. We tend to cook our own meals and found the kitchen well-equipped for doing this. " "Cute little cottage, liked that it is so close to shopping and the ocean. Will definetly come back and stay. 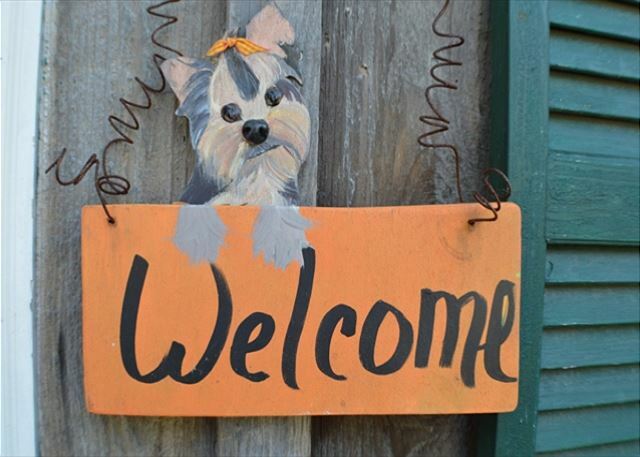 Thank-you"
"We had a great time at Calypso Cottage, we love the place and even got to bring our bulldog, Therman! His favorite part was the spiral staircase. " "Easy to get to, cozy. The spiral staircase up to the master bedroom is a bit scary. Nicely furnished. " "We stayed 3 nights at the Calypso house in late July and enjoyed it very much. The property management staff made the resevation, payment and check in/check out very easy. For a relatively small house, it feels quite big. We had 6 people and everyone enjoyed it very much. The deck faces west for nice afternoon sun and the beach is a short walk up the street. We walked into town several times too. The house had everything we needed and was in good general shape for a rental beach house. We only found 4 bath towels though, so we ran short for 6 people, but we did find a few beach towels in a dresser drawer which sufficed. I would recommend the Calypso house for a group of 6 or less anytime!" "The cottage was very quaint and comfortable. We had a family of four stay and found it perfect! We loveed the convenient location too. We would definitely want to stay at the Calipso Cottage again."